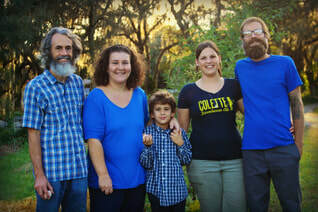 The Malloys have lived in the Tampa area for 20 years. Travis is president of the TT Community Gardens, and member of the TT Garden Club. Jamie is president of Riverhills Elementary PTA. Hank is a good boy. We bought eight acres of unique land near Hwy 301 and Harney Road. In the past two years, with the help of our friends Dave and Vicki, we’ve turned half-jungle, half-parking lot into a food-producing environment. And it’s getting better every day! We strive to raise our animals in the most natural, humane, environmentally beneficial manner. Our herds and flocks are frequently moved to fresh land, for new food and to escape disease buildup. Our animals fertilize the land with every visit, ensuring more forage for them next time. All animals receive organic feed, and are not medicated. Fresh, healthy, locally-grown food shouldn’t be so hard to find! Tired of driving to Plant City for chickens, we decided to do it ourselves. We are doing it exactly the way we want our food grown, and are proud of the product we can share with our community. See how it’s done, from the chick brooder all the way through processing day. We want informed customers! Just call for a tour.